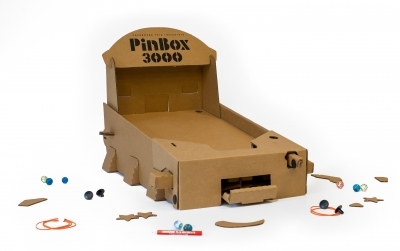 PinBox 3000 is a DIY cardboard tabletop pinball kit. Assembly time is one hour. Two interchangeable playboards allow for multiple game designs. Two games may be linked together for 2 player Battlemode! Bulid, Design, Play! The design is surprisingly durable for a cardboard pinball game. We built it and then couldn't stop playing with it. So Fun! The instructions are really clear and it is really easy to build. My daughter loved playing it. Looks like it's a two part project. It's a craft to put together and then its a game, that's awesome! I love that you can decorate it as well because the material is easily accessorized. The game seems fun, gives a great opportunity to talk about games from my own childhood, such as pin ball! What a unique and fun game idea! I haven't seen this before, I love new toys! This isn't gender specific so boys and girls can play!